No, I’m not kidding you. I actually made this. And it was GREAT! A few weeks ago I was at the gas station and I saw a bottle of iced tea in the cooler, it caught my eye. Pure Leaf was the brand. 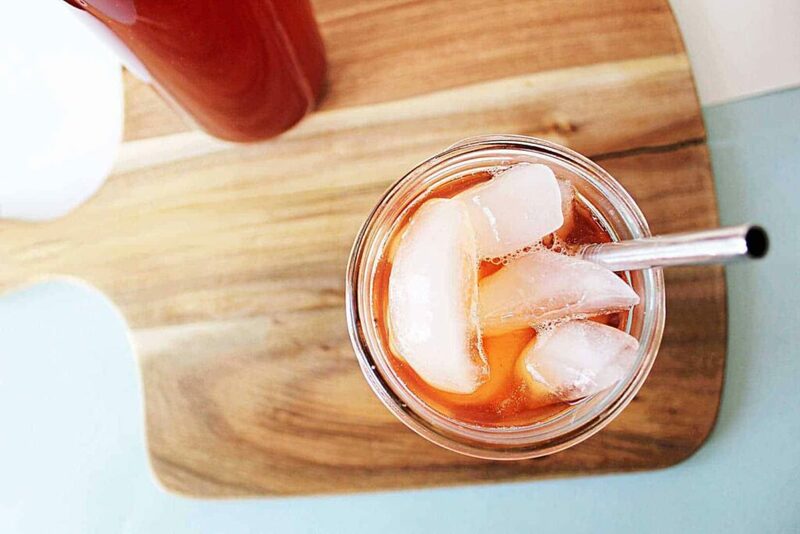 I’m not a big juice drinker, and I hardly ever drink pop, but I’ve always had a soft spot for iced tea. So I tried it. It was a little sweet for my liking, well, a lot sweet, I ended up diluting it 50% with water. But I still liked the flavour, a raspberry infused iced tea. 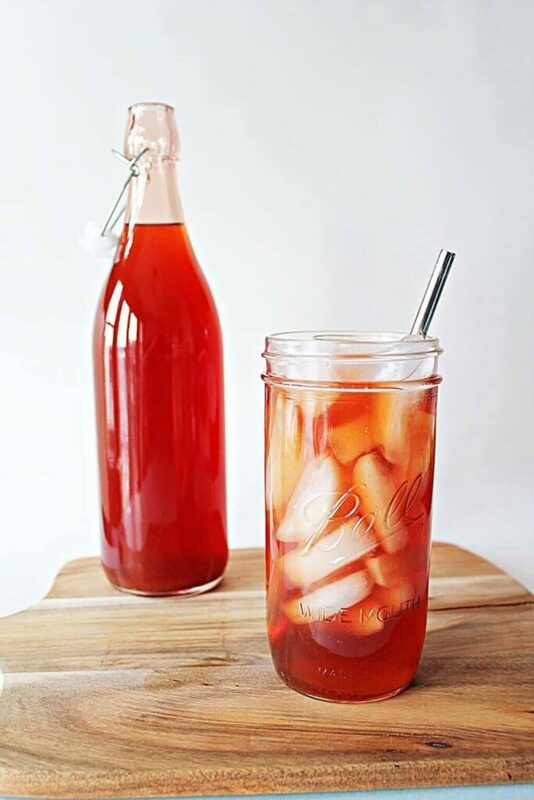 After I bought the 3rd bottle of it within a couple weeks, I thought to myself; now self, you’re pretty enterprising in the kitchen, why haven’t you made this yet? I didn’t have a good answer. So I set about making myself some. It was incredibly easy, the recipe is totally versatile, and it uses simple syrup, which is like my favourite thing! Why balsamic? Well I started making my simple syrup with just strawberries and was thinking what flavours I like with my strawberries, and realized that I love a good spinach salad with balsamic dressing and fresh cracked pepper, so why would this be any different?! Add strawberries, 1/2 cup water, and maple syrup to a small pot. Bring to a simmer. Add balsamic vinegar and pepper if using. Simmer strawberry mixture until strawberries are release their juices and the mixture thickens slightly - remove from heat. Meanwhile, add 8 cups of water to another pot and heat until nearly simmering. Remove from heat and add tea bags - steep for 5-6 minutes. While the tea is steeping, strain the strawberry mixture through a fine mesh sieve, reserving the liquid. 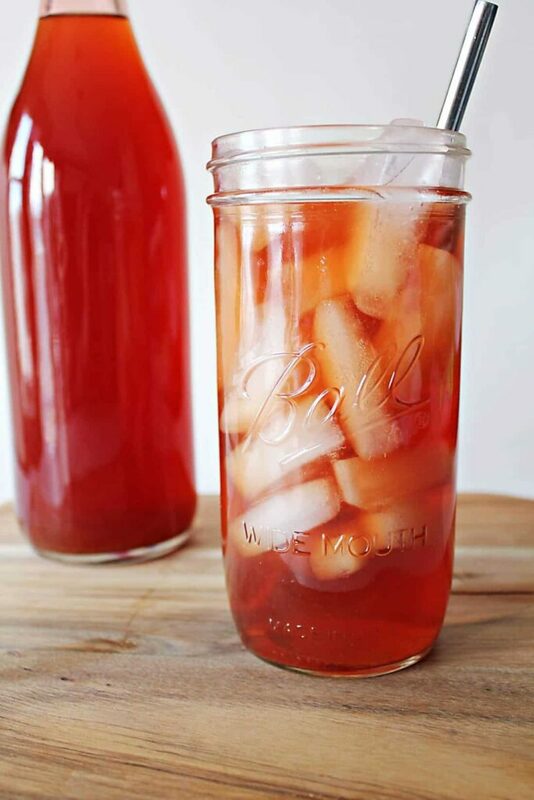 Combine the steeped tea and the strawberry syrup. Transfer to a large storage container and transfer to fridge. Serve chilled, and preferably over ice! If you're just wanting plain strawberry iced tea, you can always omit the balsamic and peppercorns. Recipes are only good if they work for you! 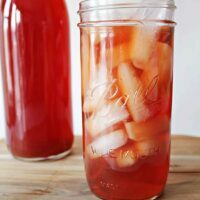 PIN THIS STRAWBERRY ICED TEA RECIPE FOR LATER! Previous Post: « Our Family Has Grown By 4 Feet!